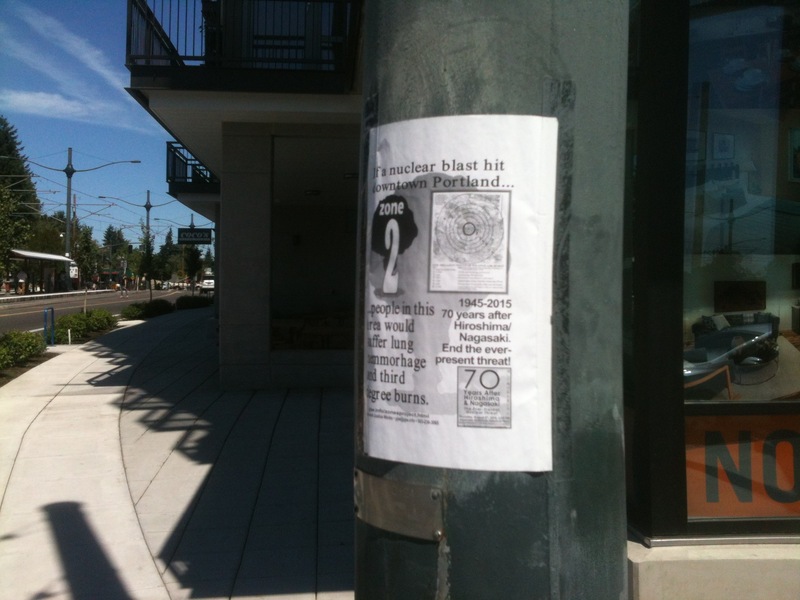 After posting about emergency preparedness, I spotted a poster one afternoon on my way home from work. Hmmmmm, Zone 2? If a nuclear blast hit downtown Portland… Wait a minute. I’m already invested in worrying about an impending earthquake. Do I really need to consider a nuclear blast? Unless somehow really has it out for Mayor Hales and Councilman Novick, I’d like to think we’re safe from a good old atom bomb bombing. I had to consider what the sign meant by Zone 2. 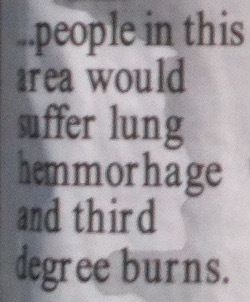 Okay so if I’m in Zone 2, I have lung hemmorhage and third degree burns to look forward to. This sign was spotted at least a couple of miles from downtown so perhaps I don’t have to consider moving to East Portland yet. I think I may worry more about the impending condo implosion. 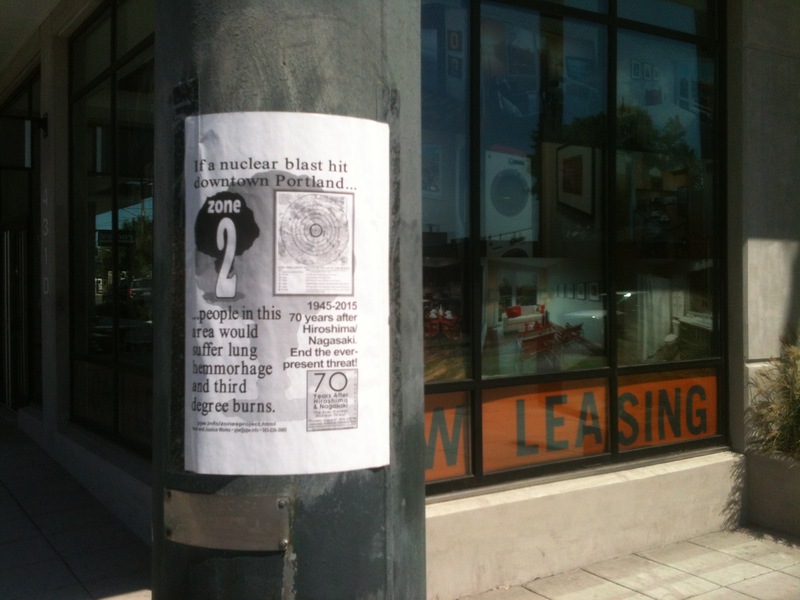 These posters were placed as a reminder of the 70th anniversary of Hiroshima and Nagasaki. I appreciate how we have to consider the consequences of the havoc brought on by nuclear war. My thought was to create a pledge, probably not too original but If I can get all seven billion plus of us to sign this, I think I could get a handle on ending the threat of nuclear war. I, (your name here) pledge to no longer consider making nuclear weapons, use nuclear weapons in any shape or form or proliferate the ones that have already been made. Sure it’s an over simplification but it’s a start. Let’s get ready for the earthquake and hope we never have to deal with the folly and the skin and lung ailments that would result in a nuclear blast. While I’m getting political on the pages of a blog that usually concerns itself with random acts of creation and other assorted trivial matters, I thought I’d throw out a shout out to the people at the bridge this week. While I missed most of it because I started a new job I did catch enough to see the conclusion of the stand off. 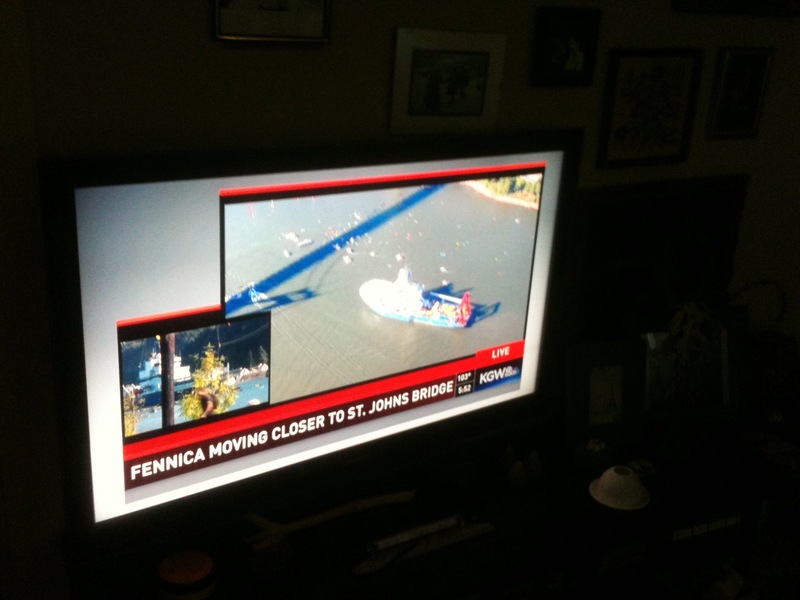 The end was actually the ship escaping the Portland area by scurrying under the St. Johns bridge. The only coverage I was able to provide is a picture I took of the action as it was being broadcast on our television set. The Fennica is an arctic ice breaker ship working for Shell oil. I can only assume it is on it’s way up north after having it’s hull repaired in Portland. There were people hanging off the bridge on what looked like colorful ribbons and many kayakers in the water making a desperate attempt to keep the ship at bay. While I’m not a fan of that cutesy label kayactivists I admire the efforts of anyone fighting the Coast Guard and Big Oil. Of course it failed. I documented our run in with the Coast Guard on this blog. I’m aware of how tough they can be. In fact what I saw on the news looked like a Coast Guard boat running over a kayaker while a woman in a Bay Watch bathing suit jumped out of another boat to grab the man who had been knocked out of his craft. Sometimes it all seems like a whole lot of something for nothing but I appreciate those who tried. I understand that many of the folks were outside agitators from Greenpeace, but there were people from Portland who were also willing to risk being arrested for the cause. I really see it as a time to start considering our energy future and whether it’s worth tampering with the delicate ecosystem of the Arctic. Every time there has been a sHell No! protest in the area in recent weeks I’ve had some prior commitment but I’m proud of the people willing to raise a little Hell to bring some awareness to the struggles of our times.